From left to right: John DiCiurcio, Jean Vidal, moderator Bill Wilson, editorial director, “Roads & Bridges,” Ray Bond, Ross Myers, and Matt Cummings. 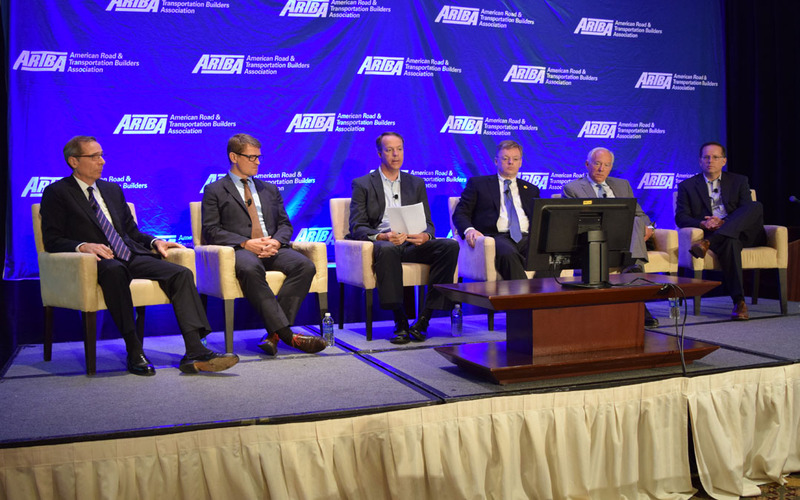 Convincing Congress to fix the Highway Trust Fund and pass a long-term highway and transit bill remains a top challenge for the transportation construction industry, a panel of top executives Oct. 1 told ARTBA’s National Convention in Philadelphia. The industry also must step its workforce recruitment and retention efforts as it continues to embrace new technology and other innovations. John DiCiurcio, CEO at Flatiron. The panelists said they have seen “moderate” growth of two to three percent over the past few years. DiCiurcio said his firm is developing work backlogs and sees more opportunity in the future. Cummings said the “wildcards” remain domestic politics and economic factors outside the U.S. Bond specifically mentioned China as a concern. Cummings said such increases are welcome, but the impact is not yet dramatic. Bond said it could take two or three years for these new funds to reach the market. Myers added the only way for state gas tax increase to have real impact is in combination with federal leadership and funding. DiCiurcio agreed, saying that mayors and governors get a lot more done by rallying local support. It’s hard for Congress to connect the challenge with the solution, he said. HOW ARE FIRMS ADDRESSING WORKFORCE ISSUES? Once the funding crisis is solved the industry will have plenty of jobs, but the need to engage the workforce will continue, DiCiurcio said. Myers said his firm begins recruitment as early as the fifth and sixth grades. THOUGHTS ON CHANGING FUNDING MODELS? Myers said the industry is resilient and will adjust to other funding models. “Let’s just make up our mind which one it’s going to be,” he said. The panelists agree that design-build models are leading hybrid public-private-partnerships (P3) strategies at the state level across the U.S. But Bond said having so many model creates huge expense and complications.